If limescale settles in the dish washer primarily this is troublesome. Its interior and rubber seals need cleaning more often. The main problem is not visible at first sight. 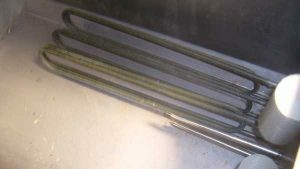 To heat up the washing water there is a heating coil (similar to immersion heaters). If this is incrusted with limescale the dish washing is less efficient, as more energy is needed to achieve the same temperature level of the water. In most cases a small salt container in the dishwasher ensures the water softening. Some customers soften the water before it enters the appliance. Nevertheless in some cases there are still areas where limescale can settle. Especially were only few water runs or the surface isn’t smooth enough. For this case study we traveled to Australia. Especially in the region around Perth problems in the water carrying systems occur. In general water is rare, exceptional hard and aggressive. The reason for that are the many foreign substances in the water. Our customer is a big hotel, primarily worried about the automatic dish washer. The dish washer is fed partly with desalinated and well water. 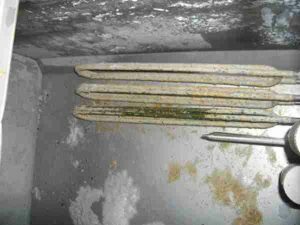 The limits of capacity of the softener was reached and still there were huge amounts of limescale at the interior. Only through regular extensive cleaning works with strong descaling agents the operation of the dish washer was possible. A heating coil with incrustations wastes energy and the time needed until the temperature level was reached increased. Due to the heat the existing deposits became even harder and harder to remove. A second problem was that through a nozzle blocked by limescale less water can run. The result is dirty dish after the washing. We decided to install one Merus Ring at the water inlet. After just a few days the limescale’s texture was softer. 8 weeks after the installation of the Merus Ring the dish washer looked as good as new. Usually a Merus Ring can keep the calcium carbonate solved also at high temperatures. Thus in the best case there will form no deposits at all. The biggest success for us is, if the customer is able to operate the automatic dish washer without adding regenerating salt at all. This is the case in about 50% of all cases.